I’ve heard that if you ask an elderly person to look back over his or her life and think of the decade they were the happiest, they’ll most often pick their forties. Hearing that in my early forties, I find it easy to believe. It’s the time in your life when, if you’re lucky, your children are growing up, gaining their independence (with the happy side effect of letting you regain yours) and turning into the amazing people you’ dreamed they’d be. Hopefully your parents are healthy and active, enjoying or happily planning their retirements. You’re likely to be settled into a happy relationship with someone you dearly love — or maybe you’ve gotten out of a relationship that wasn’t working and are getting a fresh start. You’re probably feeling good in your career, living in the biggest home you’ll ever own and have enough spare time and funds to engage in hobbies you enjoy. If you’ve made it to your forties, you’re bound to have had enough heartache to help you appreciate how very precious life really is. You’ve lived long enough to know that this, in its own way, can also be good. You feel a balance that swings between “there’s still time” and “appreciate every moment”. And you’ve hit that strange, overlapping time in life where you still have friends having babies (surprises and long-hoped-for) right along with friends becoming grandparents. Grandparents! And it’s wonderful. So much to celebrate! 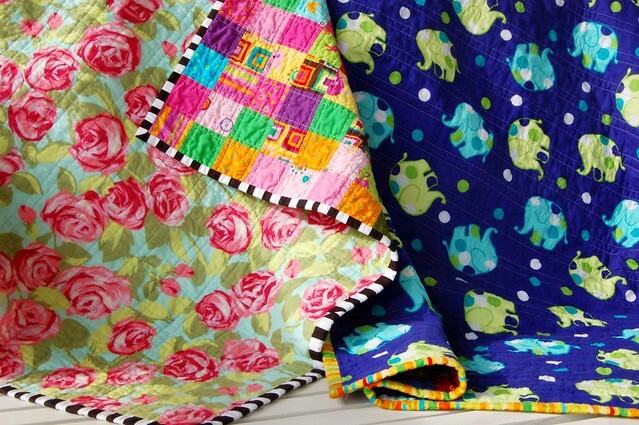 I purchased a jelly roll of Animal Party fabrics by Amy Schimler with no real idea what I was going to do with it. Then I learned my friend Melanie is having a baby. Oh yes, I laughed! 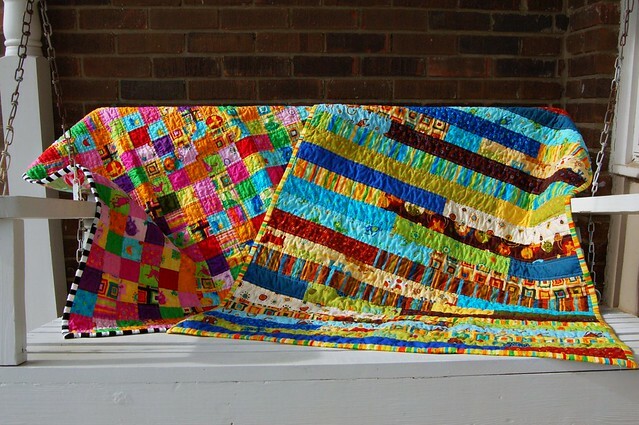 And then I told her I wanted to make her baby a quilt and started pulling out all the girly fabrics for her sweet August baby. Then I heard my friend Sally is going to have a grandson in September, and there I was with a little pile of boy colors just waiting for him. 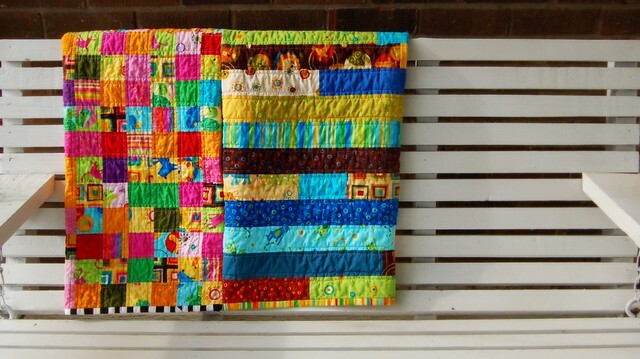 So now there’s a bright little girl quilt that will belong to a little West Virginian daughter, while it’s boyish counterpart flies off to Hawaii to welcome a first grandson. There are blessings all around us and oh yes, life is good! Thanks, Amanda! Don’t fear your forties at all — there are down sides, but so many good things, too. Sarah…you are so thoughtful and I so appreciate you thinking of my first grandchild! I love it and so will he! It makes me happy to make something for him, Sally! I hope he loves it, my girls always found creative ways to play with blankets. 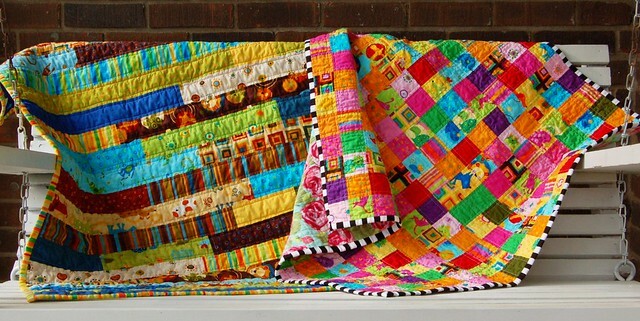 (I wish I knew how to quilt when they were little!) 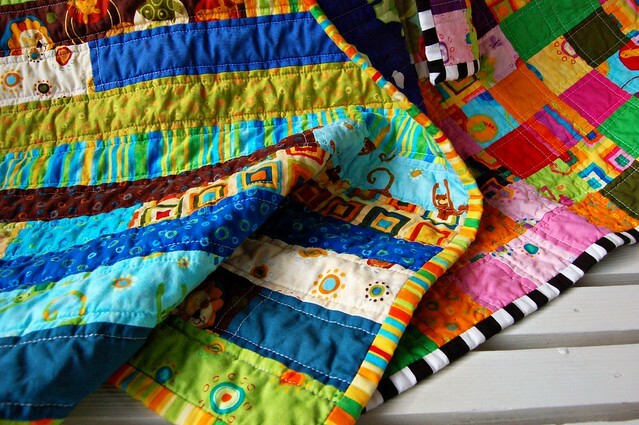 It’s a sturdy little quilt, so you can throw it in the washer in cold water and tumble dry low as often as needed. It should get softer and better as it ages!